We offer our RasPiBox Open DIY kits - a DIN-rail enclosure for the Raspberry Pi - with an additional voltage regulator module now. 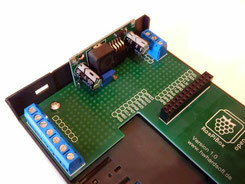 This module works with a switching regulator and can handle input voltages up to 40V DC. With the voltage regulator module you don't need additional a power supply for your Raspberry Pi project.